The ideas above are among the visions that emerged from the imaginations of Burlington residents and professional planners who collaborated in a week of brainstorming sessions, collectively known as a charrette, that culminated in a public meeting at City Hall Auditorium Monday night. The initiative is part of a federal sustainable communities program that in 2010 awarded grants to 62 of about 800 applicants nationwide. Burlington used a $187,000 allocation to retain a Tennessee-based consulting firm, Town Planning & Urban Design Collaborative, that is synthesizing a first-ever master plan for the city’s downtown and waterfront. W. Brian Wright, the firm’s founder and chief, says Plan BTV includes project proposals that can be implemented in a matter of months, along with ideas for the medium term — between five and 20 years — as well as a century hence. The grand plan, which will be unveiled as a formal document this spring, is intended to move the city toward adoption of form-based zoning regulations. This fashionable approach to urban planning involves visualization of Burlington’s core as a total design rather than a set of separate land-use considerations, as is the case at present. Over the week, veterans of Burlington development battles expressed surprise at the generally muted opposition to proposals that, in the past, have generated ferocious smackdowns. Burlington Director of Planning and Zoning David White sees the possibility of breakthroughs arising from a new public consensus in favor of denser development and firmer connections between Church Street and the waterfront. 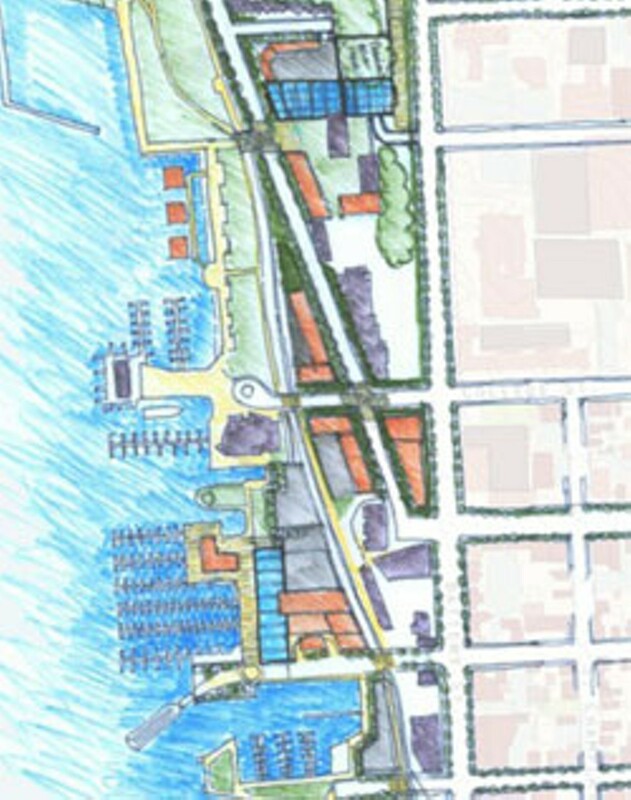 Add several more buildings on the waterfront? Only Rick Sharp, one of the pioneering proponents of the Burlington bike path, suggested at a January 27 session that such development would violate the public-trust doctrine that forbids private construction on filled land. The broad acquiescence might reflect the self-selected makeup of the participants, which appeared to omit some segments of Burlington’s population. Three months of outreach efforts wasn’t enough to generate input from Burlington’s racial and ethnic minorities. Not a single resident showed up last Saturday for a publicized multicultural breakfast at 1 Church Street. Some Burlington artists also complained about not being consulted. Only a few took part in a cultural focus group at 1 Church Street, where just eight pieces of art were entered in a juried show on the theme of visions of Burlington. Overall turnout was pretty good, though. About 75 people took part in an opening-night exercise in which groups of participants pasted green (like), red (don’t like) and blue (see opportunity) dots on 10 laminated maps of the downtown street grid and the waterfront acreage between the rail yards to the south and Depot Street to the north. On many of the maps, red dots covered the mall complex extending from Church to Battery and from Cherry to Bank streets. Some 50 locals gathered for a midpoint review on January 27, at which Wright and two members of his 13-person team outlined ideas culled from the mapping session. 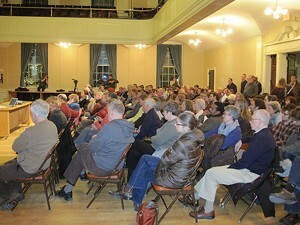 More than 100 listeners were on hand on Monday, January 30, for Wright’s two-hour closing presentation. In addition, 300 or so Burlingtonians stopped by throughout the week to take advantage of daily informal talks with the planning team at 1 Church Street, White says. Several more wrote comments on the Plan BTV Facebook page. Wright and his fellow engineers, architects and designers also organized nine focus groups with specific segments of the local community, such as developers, business owners, transportation specialists, environmental advocates and the aforementioned cultural community. But occasional remarks by the Tennessee crew made it seem they had parachuted into the Hilton Burlington. At one point, Wright proposed that a fire station should be built alongside the existing police headquarters on North Avenue. A listener pointed out to him that a fire station was already in place two blocks to the north. “What is this — Cherry Street?” one of the visiting consultants asked while pointing to a map projection during a public presentation. Many of those who did contribute to Plan BTV expressed enthusiasm about the process. “This is a really great idea,” declared Tove Ohlander, co-owner of a glass studio on Pine Street, as she filled out a questionnaire at 1 Church Street. “It’s so positive to have everyone give their own views.” But Ohlander also wondered how it would be possible to reconcile what were sure to be conflicting views in a final plan. Eventually, Plan BTV will be reviewed by the Burlington Planning Commission and City Council, with public hearings along the way. To actually be implemented, however, the downtown-waterfront blueprint will require changes in a city zoning code that underwent a protracted revision process just a few years ago. It proved so rancorous that, in 2009, Burlington police were called to City Hall Auditorium as city councilors traded invectives over a proposal to increase allowable downtown building heights by a few feet. Regardless of what’s ultimately put on paper, nothing at all will be built unless private and public developers ante up wads of money — a dubious proposition in an anemic economy. Even then, state and city regs may still enable a single motivated neighbor to block a project for years, in the process raising its costs to the point where it becomes nonviable.